WATER, MUSHROOMS, VEGETABLE OIL (CORN, COTTONSEED, CANOLA, AND/OR SOYBEAN), MODIFIED FOOD STARCH, WHEAT FLOUR, CONTAINS LESS THAN 2% OF: SALT, MONOSODIUM GLUTAMATE, SOY PROTEIN CONCENTRATE, DEHYDRATED CREAM (CREAM [MILK], SOY LECITHIN), YEAST EXTRACT, FLAVORING, DEHYDRATED GARLIC. In a blender , combine all the ingredients except the arrowroot. Blend well and transfer to a sauce pan . Add in the arrowroot and cook on medium heat for about 5-10 minutes just to let the flavors develop. Refrigerate for later or even freeze it. This recipe makes about 2 cups. Enjoy! This looks great and so easy too! Thanks for sharing it! Do you know - would this be the equivalent of one can? Thank you! Yes 1 can is = to 2 cups. :) It's just the right amount. This sounds super easy! Not much harder than it is to open those cans! I don't have any arrowroot powder, could I substitute for something else? I'm not watching my gluten per say... just trying to buy the non gmo stuff. Thank you for sharing, I can't wait to try this out!! Thanks! The only other thing similar to arrowroot is cornstarch. Most of that is GMO, but maybe you can find an organic brand? What kind of muchrooms did ypu use? Aso...do you leave any whole? Csn you freeze this? You can freeze it. I use regular button mushrooms. I chopped them a bit before blending, but you can probably throw them in whole too. I found two different brands of organic starch at Wegman's. One was LET'S DO ORGANIC: The other was RUPUNZEL organic corn starch. There was also Kuzu ROOT STARCH. I had no idea that Let's Do Organic made a starch. I will look for that next time. We were given a bag or organic arrowroot from my in-laws. Thank you, thank you, thank you. Once again your timing couldn't have been better. Canned soup, and/or deleting them from my life, has been my latest obsession. Just one question, is the arrowroot powder a thickning agent? Yes it is. You might be able to use flour instead, but I haven't tried. Melissa, Thank you very much for posting this - it's something I've been wanting. I invented my own cream of chicken soup for cooking, but had not gotten around to mushroom soup. I like homemade versions so much better than the canned ones. The flavor is better, not to mention the healthier ingredients. You're welcome Susan. I hope you enjoy my recipe. Susan's would you be willing to share you cream of chicken soup recipe? The liquid in that recipe is used to boil the green beans separately. So, would I follow the green brean casserole recipe exactly as is and then add this soup at the end? If you are making the standard green bean casserole, you can add the soup to it. My green bean casserole recipe on my blog already includes a "soup." I wrote that recipe last year separately from the soup I just created. I hope that makes sense. The green bean casserole I came up with on my blog last year makes a smaller portion. More like a 1/2 casserole. Yes that makes sense! Thank you! 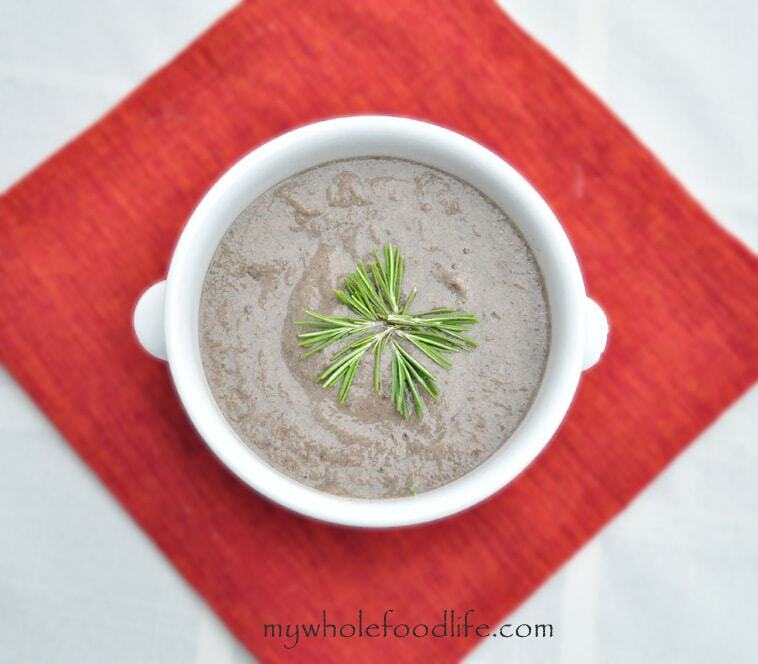 Now can you figure out a Golden Mushroom soup recipe that's dairy, corn and gluten free? :) That and regular mushroom soup were staples of my mom's recipes! We have been talking about a regular mushroom soup, but I have never heard of golden mushroom soup. Do you have a recipe? Made this for broccoli casserole for Thanksgiving. My hubby was happy to eat the leftovers. how could i make this work in recipes that use the condensed version in a can? since i would be using the stuff straight from the can without adding the extra liquid back in like i was making soup, i'm desperately looking for a good alternative that results in a condensed soup rather than a ready-to-eat soup. i have a kid with a food allergy that prevents me from being able to use the store bought stuff, although looking at the ingredients list makes me pretty glad i have to remove it. I just made this for Sunday night dinner with biscuits and green beans and it was fabulous! Thank you! You are so welcome Rachel! Any chance u could sub tapioca flour? Maybe? I think it might work. Is this the same thickness/consistency of the condensed version that is traditionally used in casseroles? Or is there a way to condense it? Do you think, if it were made into a casserole, that it would freeze well? Thank you! Hello, I was wondering if you had any recipes for dinner casseroles that would feature this healthy mushroom soup? A Healthy tater tot casserole maybe? Melissa, wonderful recipe, but is it OK to eat "non-cooked" mushrooms? I've always read that we must cook them? Thank you..
Hi Nancy! I have actually never heard that before. I have never had an issue eating uncooked mushrooms. I do like sliced, raw mushrooms on my salads from time to time.